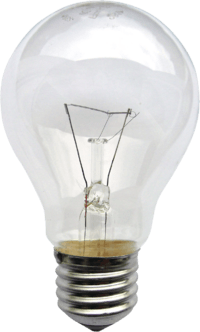 The A-series light bulb is the "classic" type of light bulb that has been the most commonly used type for general-purpose lighting applications since the early 20th century. It has a pear-like shape and an Edison screw base. The number that follows the "A" within the A series indicates the width of the bulb in one-eighth inch units or in millimeters. The most commonly used A-series light bulb type is the A19 bulb (or its metric equivalent, the A60 bulb), which is 2 3⁄8 inches (60 mm) wide at its widest point and approximately 4 3⁄8 inches (110 mm) in length, and has a one-inch long (type E26, i.e. 26 millimeters in diameter) Edison screw base. Other base types most commonly used in UK, Australia, and New Zealand include the E27 (i.e. 27 millimeters in diameter) Edison screw base (which also fit E26 sockets), and less commonly these days; the B22 Bayonet twist type base. Although most A-series bulbs have historically used incandescent lighting technology, some other technologies – such as Compact Fluorescent (CFL) or LED lamps – have been used in A-series bulbs more recently. ↑ "Lamp Size and Comparison Features" (PDF). WW Grainger Inc. Lamp size (maximum lamp diameter) is expressed by a number representing eighths of an inch. 1 2 "LED University: Light Bulb Shapes and Sizes Explained". EagleLight. 'A' type bulb shapes are standard house hold light bulbs. The number after the bulb shape is the number of eighths of an inch in diameter. For non-imperial measured bulbs the number following the bulb shape is the number of centimeters [sic] at the widest point of the bulb. Standard bulb sizes include A19 for imperial measurements and A60 for a slightly smaller metric measured bulb. 1 2 "Light Bulb Reference Guide". Superior Lighting. The letter indicates the shape of the bulb and the number relates to the diameter of the bulb in eighths of an inch. The most commonly used household bulb is the A-19.